Following his Academy Award nomination for Best Actor in A Song to Remember, Cornel Wilde arrives in Sherwood Forest as the son of the now gray-haired Robin Hood (Russell Hicks). Having been trained for battle since the age of ten, Wilde’s Robert pledges “Death to the Regent’s Tyranny,” fighting alongside his recently banished father, the Earl of Huntington, as they vow to save the imprisoned young King of England from the vicious William of Pembroke (Henry Daniell), hell-bent on abolishing the Magna Carta which allowed citizens of the land to rule themselves. 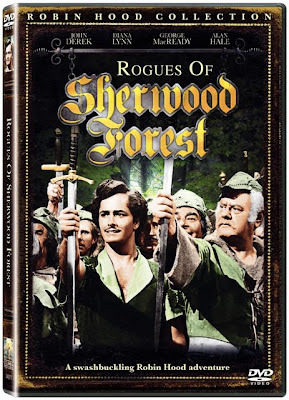 While aficionados will note the change of the traditional background of Nottingham to the replacement of Huntington in director Harry Levin and George Sherman’s 1946 release just debuting onto DVD for the first time in history, the rest of the movie is pure, traditional Robin Hood adventure. Gorgeously lensed by cinematographer Tony Gaudio – himself a Robin Hood veteran of the 1938 Errol Flynn incarnation – this Technicolor effort for Columbia Pictures based on Paul A. Castleton's novel Son of Robinhood is one of the standouts of the recent quartet of releases. 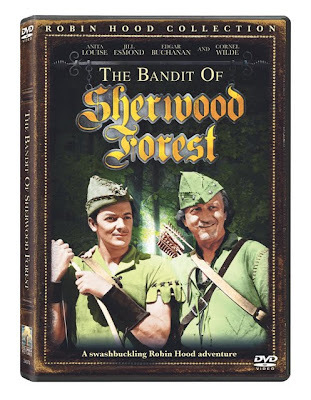 The Bandit of Sherwood Forest is set apart thanks not only to the jaunty and more lighthearted approach in characterization and tone but also due to the breathtaking Technicolor process that makes this work look as sumptuous as MGM musicals of the same decade. Easily the most sophisticated of the lot as the subheading of the film is known as Alexandre Dumas’ Prince of Thieves, director Howard Bretherton’s film is a far more traditionalist and old fashioned depiction of Robin Hood, portrayed by popular ‘40s action star Jon Hall. Shot in Cinecolor, the work is elegant but overly convoluted, especially where the dialogue is concerned as sentences sound anachronistically Shakespearean when used in contrast to the swashbuckling action and Robin’s flirtatious behavior towards Maid Marian (Patricia Morison). While Prince of Thieves was no doubt a large influence on Kevin Costner’s popular ‘90s version Robin Hood: Prince of Thieves, as a film on its own today, the vintage effort feels like a certifiable yawn-inducing fossil. 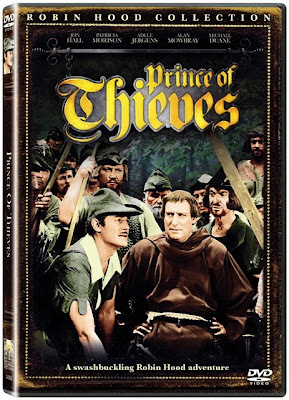 The first time in the collection wherein we actually see Robin Hood demand money from the rich and act rather roughly – despite his nonetheless joking demeanor -- Prince of Thieves is also fascinating for at least attempting to utilize his technically “uncredited” sidekicks Little John (Walter Sande) and Will Scarlett (Sid Saylor) and the Friar (Alan Mowbray), whom he meets originally in this script, penned by Oscar winner Charles Schnee (The Bad and the Beautiful). While overall, it’s still Robin Hood’s show all the way as he fights to prevent a forced marriage between Lady Christabel (Adele Jergens) and Baron Tristram (Gavin Muir) so that the fair maid can be romantically reunited with Marian’s brother (Michael Duane), its capable, ensemble cast and unique premise of fighting for love helps save it from its overly formal and restrained approach. And while we’re praising casting, sentimentally speaking you won’t want to miss Alan Hale’s final film performance as Little John in Rogues of Sherwood Forest as he tackles the same role that he played opposite Errol Flynn and Douglas Fairbanks when they suited up in their green tights to embody the legendary outlaw. Yet despite the fact that comparatively, some of the classic titles are better than Rogues indeed, nonetheless this one steers us in a more fast paced action adventure direction than the previous chronological effort Prince of Thieves. Likewise, although Prince was needlessly convoluted, the plot of Rogues is justifiably complex to match the amount of plot twists and battles involved as the son of Robin Hood (John Derek) stands alongside his father’s Band of Merry Men to fight against outrageous taxation from the cruel King John (George Macready). After a foiled attempt to murder Robin Jr. goes awry, causing him to erroneously suspect that King John’s ward Lady Marianne (Diana Lynn) knew of the plot, Robin is brought up on charges of treason when he takes on the establishment’s extreme practices of corruption. Luckily proving her innocence all along, Marianne smuggles Robin the means to escape the kingdom alive when they receive word that the King means to rebuild the gallows once again. And while it takes a little bit to get the hang of Robin Hood’s son, the Earl of Huntington who flees to Nottingham, which causes a little bit of confusion in accordance with the traditional Robin Hood mythology, this swashbuckling adventure stands as the second best work included in the new release of the four Columbia classics finally seeing the light of DVD for the first time. 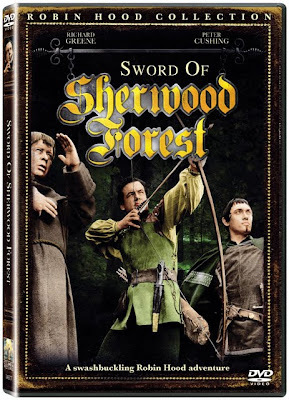 Following his performance as the lead in the television four-season run of 1955’s series The Adventures of Robin Hood, actor Richard Greene dons green once more for Hammer Films’ colorful MegaScope release Sword of Sherwood Forest. Going head-to-head with Peter Cushing’s Sheriff of Nottingham, Greene’s Robin Hood fights the good fight when the sheriff intends to confiscate the estate of the Lord of Bortrey, who perished as a free man in the Crusades. And when the Archbishop of Cantebury speaks out against this vilely selfish act, Robin acts like an early version of a double agent, by “accepting” the sheriff’s call to assassinate the archbishop, only to -- of course! -- save the day the Merry Men way in this nice but forgettable time-waster. Despite some excellent supporting help from Oliver Reed (whose lines and voice were dubbed according to IMDb) and Desmond Llewelyn of James Bond “Q” fame, the collection’s sole chance to witness a British “home-grown adaptation of England’s best-loved populist hero,” doesn’t stand up to the rest of the titles in the collection, thanks to the one-note plot that feels anything but Robin Hood-like.